I just want to say a few words about Will Williams in light of a controversy that has arisen in the past few weeks. The controversy is that Will Williams is alleged to have laid hands in a hostile way on Garland DeCourcy, an employee of the National Alliance, of which Will is the chairman. I read that he was charged with misdemeanor battery for this, but that he has acquired an attorney and is fighting it. THE Ku Klux Klan is alive and growing in Queensland, much to the chagrin of the national membership director of the Ku Klux Klan in America. Travis Pierce represents Arkansas’s Ku Klux Klan LLC, what he calls the only legally constituted Ku Klux Klan group in America. Mr Pierce said Queensland white supremacists were giving themselves Klan titles without recognition from official US Klan leaders. RACISM has reared its ugly head in Rockhampton again. Residents across the Central Queensland city have been bombarded with leaflets dropped in their letterboxes calling for “real” Australians to join white supremacist movements and to fight against crimes allegedly committed by various ethnic groups. One of the groups mentioned is a world-wide organisation called Storm Front. It has branches in the United Kingdom, United States of America, Canada, Italy and Russia, and members call themselves patriots. BRISBANE – Queensland’s anti-discrimination commissioner yesterday warned members of a white supremacist group they face prosecution if caught distributing racist leaflets in Rockhampton. Karen Walters said yesterday the commission was aware of leaflets allegedly being distributed by the Rockhampton chapter of the US-based World Church of the Creator [now the Church of Creativity], dedicated to the survival, expansion and advancement of the white race. ATSIC made an official complaint to Queensland’s Anti-Discrimination Commission about racist leaflets allegedly distributed by a white supremacist group in Rockhampton. David Wragge, the Aboriginal and Torres Strait Islander Commission’s central Queensland chairman, said the leaflets should become a test case for the state’s new racial vilification legislation. Under amendments to anti-discrimination laws last year, the Beattie Government outlawed the use of racial and religious hatred to incite violence. MEMBER for Rockhampton Robert Schwarten renewed his condemnation of white supremacist group the World Church of the Creator [now the Church of Creativity] yesterday after they plastered his electoral office with racist stickers on Wednesday night. Mr Schwarten said the attack followed his decision to stop responding to the group’s stream of “racist” letters to his office, targeting a federal racial vilification issue. Rockhampton Church’s Racist Leaflets ‘Un-Australian’: Govt. ABC News-online Monday, May 20, 2002. The Federal Government has expressed outrage at racist leaflets that have appeared in Rockhampton. The leaflets are allegedly being distributed by the Rockhampton chapter of the American-based World Church of the Creator [now the Church of Creativity]. 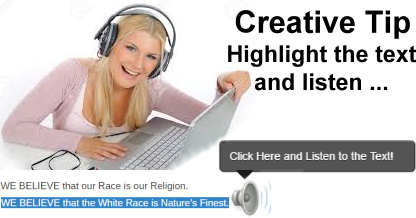 The church says it is dedicated to the survival, expansion and advancement of the ‘white race’. The leaflets refer to an Aboriginal cancer and foreign influences bleeding Australia to death. The Minister for Multicultural Affairs, Gary Hardgrave, says the leaflets are totally unacceptable. PROMOTIONAL material produced by racist white supremacist organisation, The World Church of the Creator (WCOTC) [now the Church of the Creator], was found at CQU, the day after the Multicultural Fair. A poster was pinned to a noticeboard in building 19, where many students pass through 24 hours a day. The poster was a recruitment flyer, asking for people to “stand up and fight for the White race”. The only contact details provided was a Rockhampton post office box. The white supremacist group The World Church of the Creator (WCOTC) [now the Church of Creativity] is making headlines in Queensland again, this time as one of the groups most likely to be hit by tough new racial vilification laws due to be introduced next month. Both the World Church of the Creator and the Ku Klux Klan have been under police investigation in Queensland and NSW over the past eight weeks following two racially motivated incidents. Two Australian states are to introduce laws to try to stop racist threats. There is growing evidence that white supremacist groups are renewing hate campaigns against aborigines in some provincial towns. Under legislation drafted by Labour governments in Queensland and Victoria, individuals who publicly incite racial or religious hatred could face up to six months’ jail, while companies could be fined up to $A30,000 (£11,000). Brisbane — Police in two states have moved against members of extremist race-hate groups amid a fresh wave of racist attacks on Aborigines. The Queensland Government will introduce legislation next month banning racial vilification after reports of race-hate activity in at least four regional centres. In New South Wales, a member of the Ku Klux Klan will appear in court next month on charges arising from an incident in the northern town of Casino, where Aborigines last Monday discussed mounting concerns about racist attacks. POLICE have dropped a case against members of a race hate group accused of plastering racist stickers on the walls of an Aboriginal building in Rockhampton. Police said yesterday they were powerless to act against two men from the Ku Klux Klan-aligned group which allegedly hit the Aboriginal offices in February. Rockhampton Detective Darren Lees said the investigation into the World Church of the Creator [now the Church of Creativity] members ended after police sought legal advice, which found no criminal offence could be substantiated. Anti-hate laws will be rushed into parliament by the State Government to counter an outbreak of white extremism. Last night Premier Peter Beattie confirmed that Cabinet would give the go-ahead tomorrow for anti-vilification legislation. Anyone who incited racial or religious hatred or violence would be charged with a crime, carrying a $5000 fine or up to six months in jail. Aborigines have been targetted in Rockhampton, where property has been covered with stickers urging residents to “awake” and “save the white race”. Race hate group, the World Church of the Creator [now the Church of Creativity], lashed out at criticism of its beliefs yesterday. At the same time, one of Australia’s top criminalogists [sic] branded the group violent and dangerous. In an email to The Morning Bulletin yesterday, a group representative using the name Brother S objected to the organisation being called Nazis and a hate group, arguing the church was simply a religious group.